4 days doing a combination “baited shark dive” followed by a reef / “Raggie” / wreck dive on Aliwal Shoal. Remember “Raggie” season on Aliwal is from July to October. Hope the “Raggies” remember! Tiger Shark season is from November thru May. They are also quite forgetful! 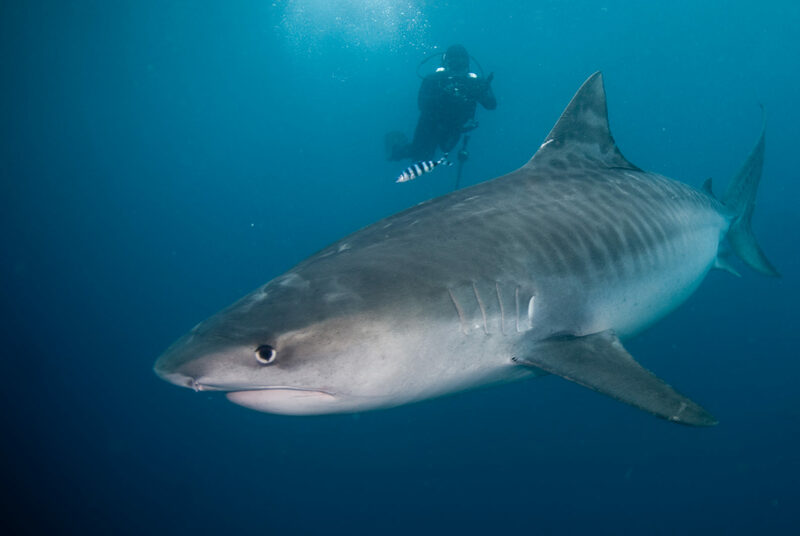 Best time of year: All year round, yet the “Raggies” (Sand Tigers) are only found on Aliwal in numbers from July through October and Tiger Sharks from November through to May. For those divers who are not mad about cold water diving or cage diving with the Great White’s this dive safari is just for you. It takes place on the KwaZulu/Natal south and north coast which enjoys a sub-tropical climate, similar to that of Miami. It includes diving Aliwal Shoal, which, if you are not into sharks, could include wreck and reef diving on the Shoal itself. Then a few days break from diving, which will appeal to that non-diving partner, whilst you look for the “Big 5” (lion, leopard, elephant, rhino & buffalo) in the Hluhluwe Game Reserve before continuing on to Sodwana Bay, South Africa’s premier dive destination. Sodwana offers world class tropical coral reef diving, as good as anywhere else in the world. After having dived Sodwana’s reefs you will appreciate why Paul Spohr of the Scuba Centres of Michigan had this to say about diving Sodwana. Experience KwaZulu/Natal “The Kingdom of the Zulu Nation” with us! 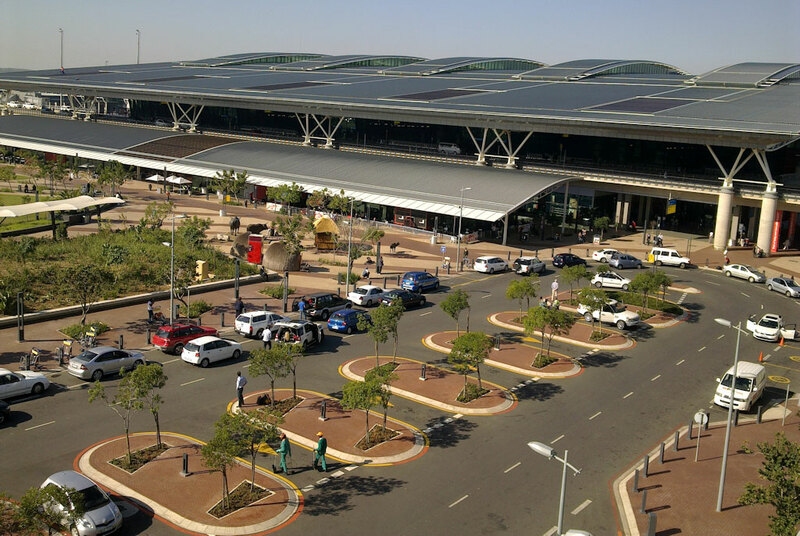 On arrival at King Shaka International Airport – Durban, own arrangements, you will be met by a representative of Dive The Big 5 for the 85kms or 1-hour road transfer to Umkomaas, and Agulhas House. On arrival at Agulhas House, you will be shown to your room and after you have settled in, Agulhas House staff will give you a lodge / dive briefing, complete all the paper work, including checking your dive c-card and fill in, and sign, your indemnity form, and issue you your MPA Permit. (Marine Protection Agency Permit.) Agulhas House staff will take your hard gear that you have brought with you (BCD, DV), and you will then go to the kit and compressor room to select your rental gear and weights. If necessary, the staff will assemble your gear in preparation for tomorrow’s dives. Your kit is now ready for your diving adventure on Aliwal Shoal. Rest of the evening is free. Dinner is served at about 19h00 but will be kept for you should you only arrive at Agulhas House later. Each evening, Agulhas House discuss and plan your next day’s tours, which are available after your dives have been completed. 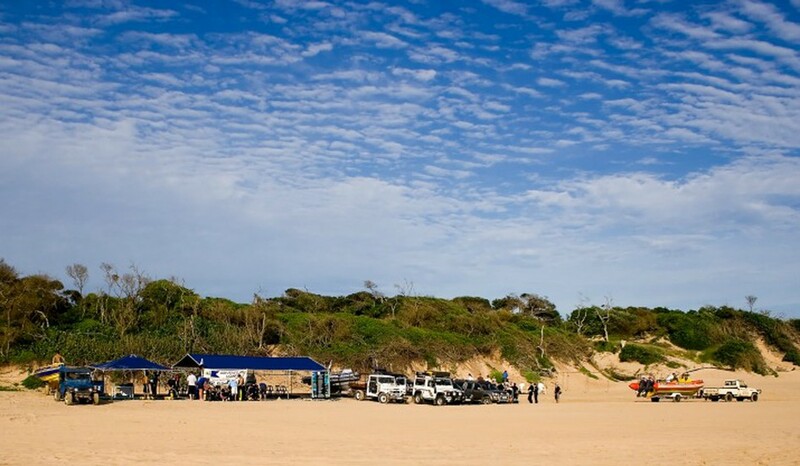 These local tours include complementary road transfers to the nearby Croc World; complementary road transfers to the nearby town of Scottburgh situated 10kms or 10-minute drive from Agulhas House; complementary road transfers to the airstrip should you with to do a microlight flight over the area; complementary road transfers to the beach for an afternoons beach walk; complementary road transfers to “Kassie,” the local village for a “Cultural Township Tour.” This is a very popular afternoon excursion and includes a visit to the local “Sangoma” (Traditional Healer), a visit to the local market, a local “shabeen” (bar) tour, and a visit to the local “eating house” (Shisanyama,) here you can savour some of the local “traditional fare” like samp & beans, morogo (locally grown spinach), pap, sheeba, etc. And perhaps the most popular of all the excursions, a tour of the East Coast Brewery! A local micro-brewery. This tour can only be done on a Friday afternoon! Please note, all transfers are complementary, entry fees and gratuities are for your own account. Overnight at Agulhas House in an air-conditioned, en suite room, on a dinner, continental breakfast, and hot “brunch”/lunch basis. 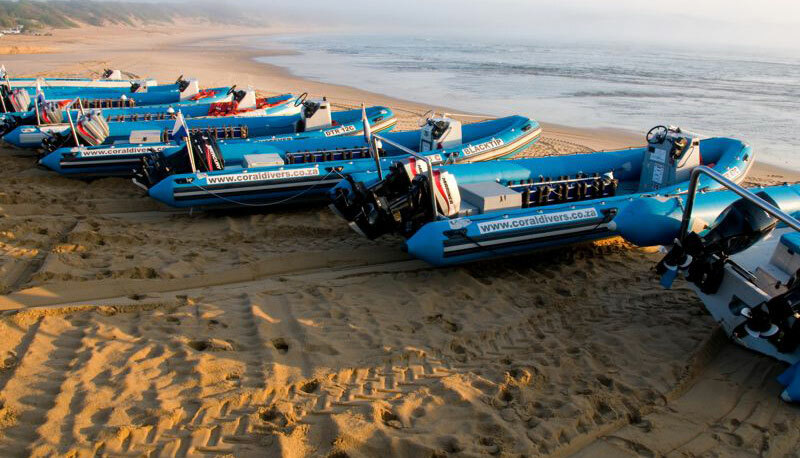 After the 06h00 wake-up call, you will have a light continental breakfast before being transferred to the Umkomaas River mouth lagoon to launch the “Duck” (Zodiac/ RIB) for your combination “baited” shark dive, which is followed by an Aliwal reef / “Raggie” / wreck dive, weather permitting. 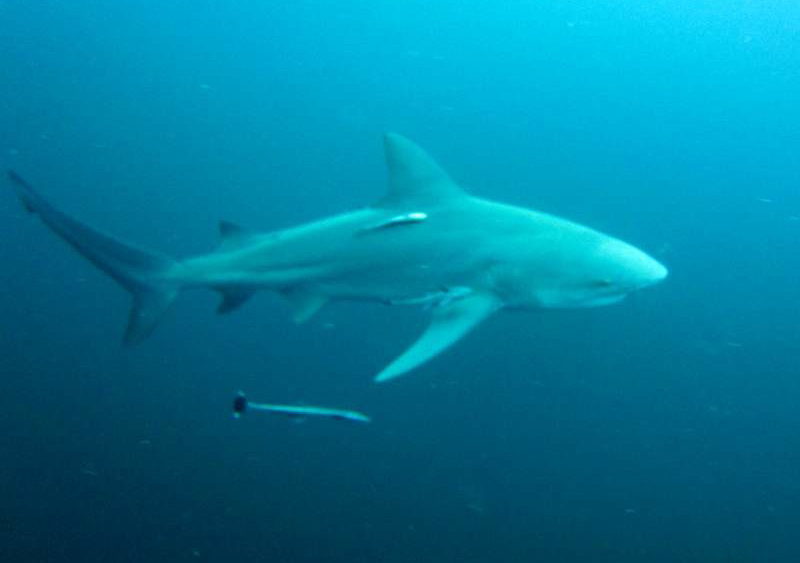 On a baited shark dive on Aliwal, in addition to your “target” species, if you have one, you can also expect to encounter Dusky Sharks and Oceanic Blacktip Reef Sharks, as these two species are present on Aliwal all year round. 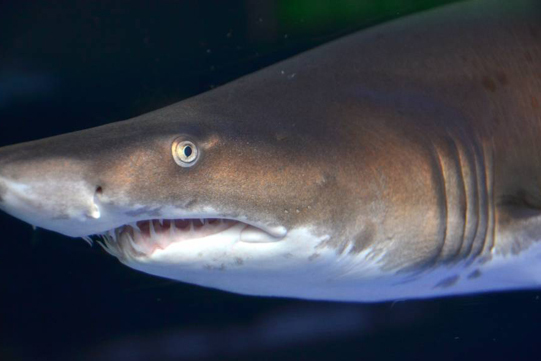 Sand Tiger Sharks (Raggies) are found on the Shoal from July through to November; Zambezi (Bull) Sharks are found on the Shoal almost throughout the year, with July, August and September being particularly “poor” months; Tiger Sharks are found on the Shoal throughout the year, with July, August and September being particularly “poor” months. Please remember, the Sharks haven’t read this e-mail, so they really have no idea where they are meant to be, and when! Mother Nature is in charge, and She sets Her own rules. 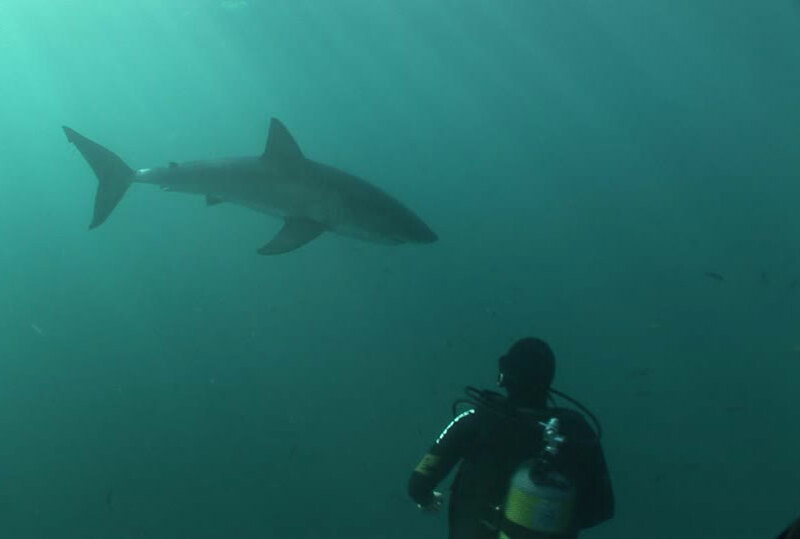 All Shark Diving on Aliwal is seasonal, as it is everywhere else in South Africa. The modus operandi for a baited shark dive on Aliwal follows the same procedure as a “baited” shark dive that takes place anywhere in South Africa. After your “baited” shark dive, you will spend the surface interval time on the dive boat out at sea, SIT is not much, as your average dive depth on a baited shark dive is only to 10-meters max. After the surface interval time you will commence with your single tank reef / “Raggie” / wreck dive on Aliwal Shoal. Water and light refreshments are provided on board the dive boat in between dives. 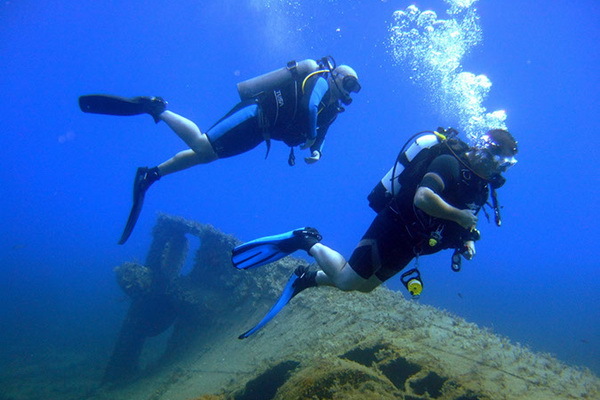 Aliwal offers some of the best diving on the South African coastline. After the dives you will return to Agulhas House at between 11h00 & 12h00 for a shower and “brunch”/lunch. Whilst you are enjoying “brunch”/lunch the Agulhas House staff will look after your dive gear for you, rinsing it in fresh water after each days diving, and washing it at the end of your stay at Agulhas House. Your wetsuit, booties etc will be left out to dry and will be ready for you in the gear room very morning. The rest of the afternoon is free. 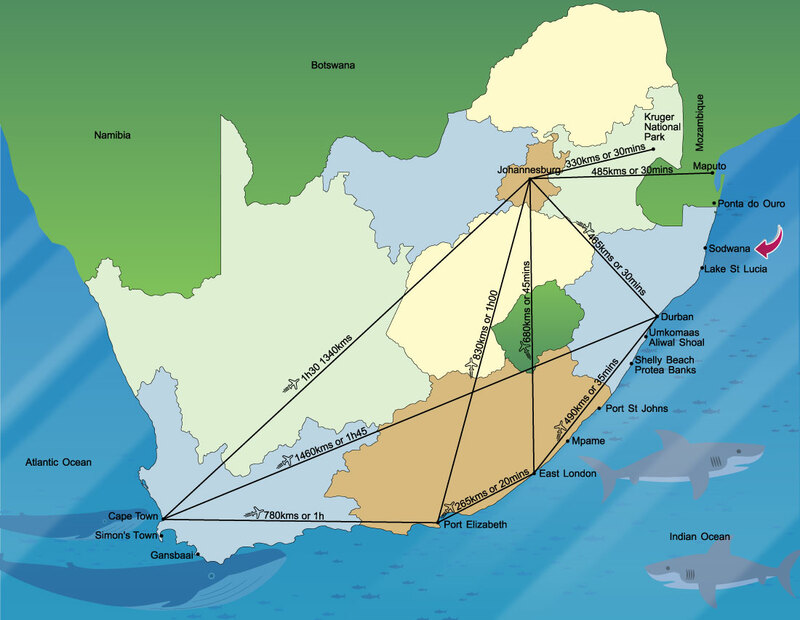 In addition to Croc World, Scottburgh, the micro-light flips, the beach walk, the Kassie Cultural Tour and the East Coast Brewery Tour, for which the transfers from Agulhas House to the destination, return are complementary, the other places of interest in the area are the nearby Tala Game Reserve, a Durban City Tour, a visit to uShaka Aquarium in Durban, a visit to the Natal Sharks Board, also in Durban and an Oribi George tour. The costs of these tours have not been included in the cost of this itinerary, and would be for your own account. Overnight at Agulhas House in an air-conditioned, en suite room, on a dinner, continental breakfast, and hot “brunch”/lunch basis. Accommodation at Agulhas House in an air-conditioned, en suite room, on a dinner, continental breakfast, and hot “brunch”/lunch basis. After breakfast, at a time to be advised, you will be collected from Agulhas House by a representative of Dive The Big 5 for the 5-hour road transfer through the heart of “The Kingdom of the Zulu Nation” and onto the Hluhluwe–Umfolozi Game Reserve. 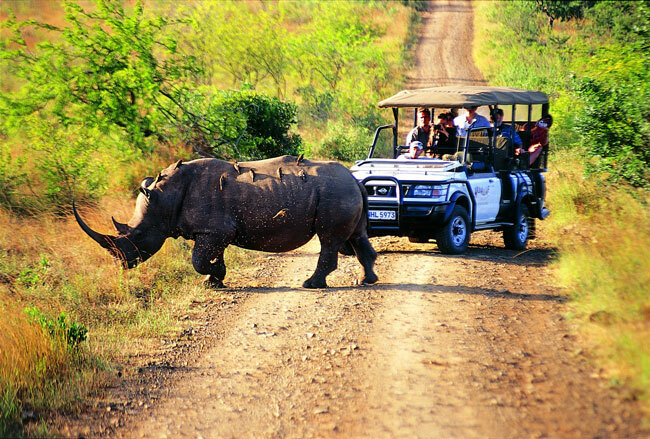 Hluhluwe is one of the oldest and largest game parks in South Africa. 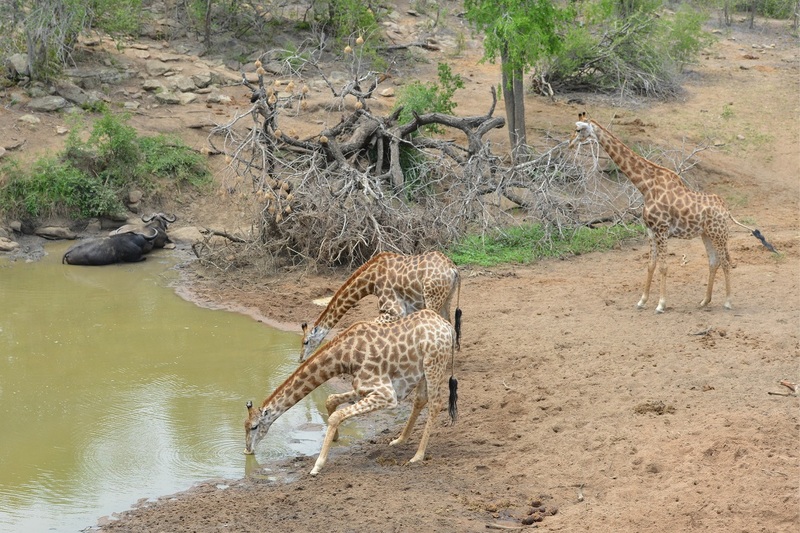 The Hluhluwe–Umfolozi Game Reserve is renowned for its wide variety of bird and animal life. Besides ‘The Big Five’ (lion, leopard, elephant, rhino and buffalo), the elusive cheetah, wild dogs and many other well – known Bushveld species inhabit the park, offering the visitors a rich game viewing experience. The park covers 96 000 hectares, and comprises three reserves: Hluhluwe and Umfolozi – two of Africa’s oldest game reserves, both founded in 1895 – and the linking Corridor Reserve, proclaimed in 1989. 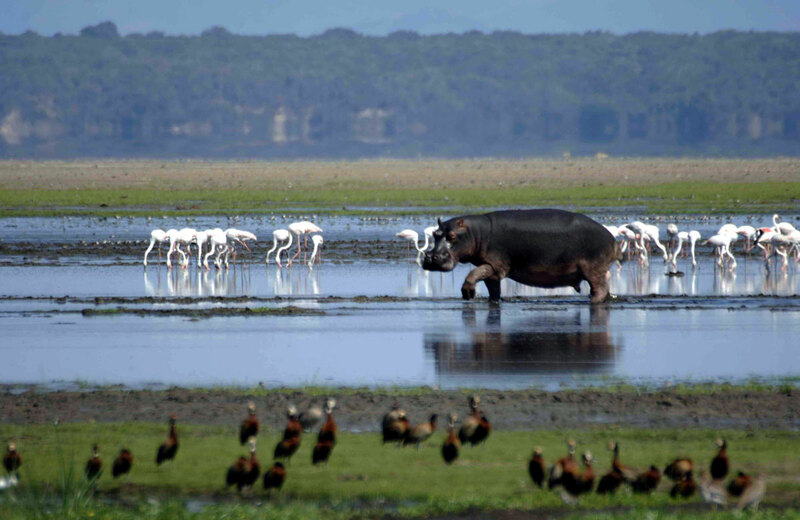 Hluhluwe has the distinction of being the oldest “formally” protected area in Africa! 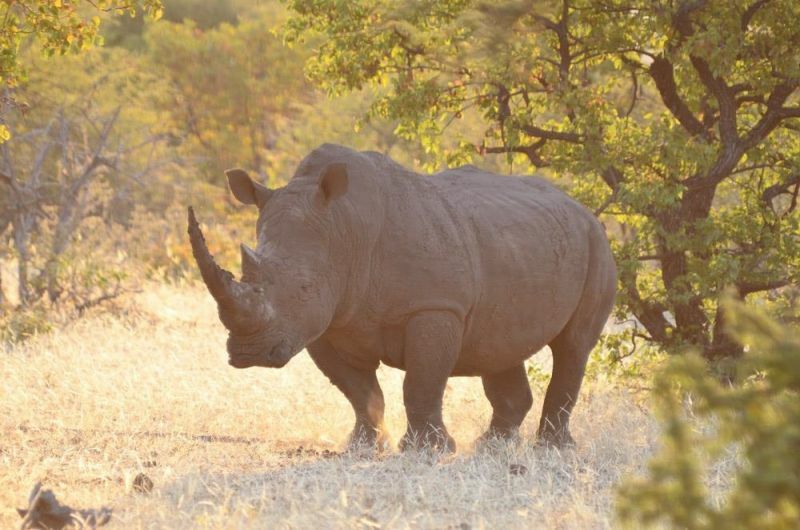 In 1895, with about only 20 southern white rhino’s surviving on earth, and these in Umfolozi, the threat to the species survival was dire, and the proclamation of the Hluhluwe–Umfolozi Game Reserve ensured their survival. The Hluhluwe–Umfolozi Game Reserve now “export” white Rhino’s to reserves all over Africa where they were originally found. A truly wonderful success story! 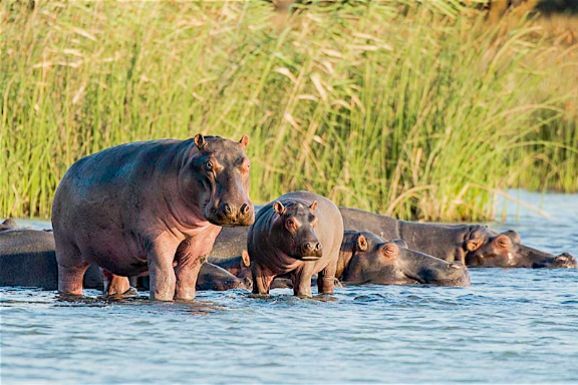 En route from Agulhas House to the Hluhluwe–Umfolozi Game Reserve you have the option of doing a short detour to Lake St Lucia to take the 2-hour boat cruise up the St Lucia Estuary to view the hundreds of hippo’s and Nile Crocodiles that have made this estuary their natural ‘home”. The cost of this tour has not been included in the cost of this tour and would be for your own account. You would arrive at Rhino Ridge Safari Lodge at 14h30 in time to check in and enjoy high tea at 15h00/15h30. 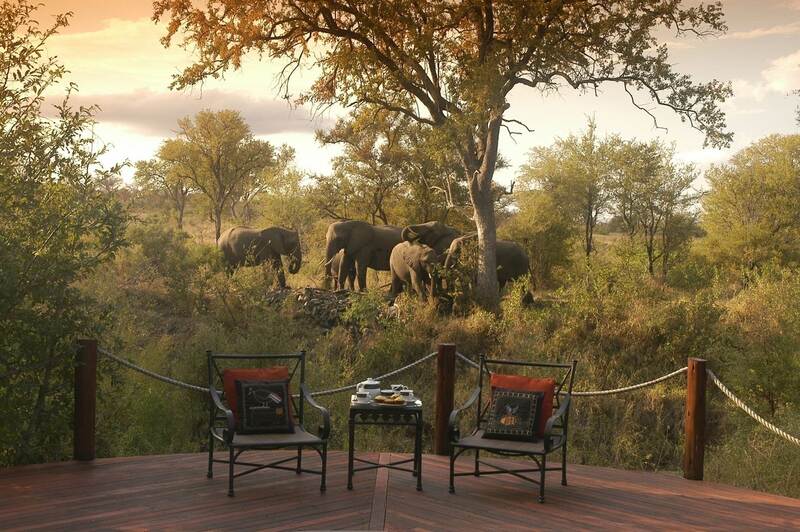 Afterwards, you will report to reception to join the evening safari departing at 15h30/16h00. 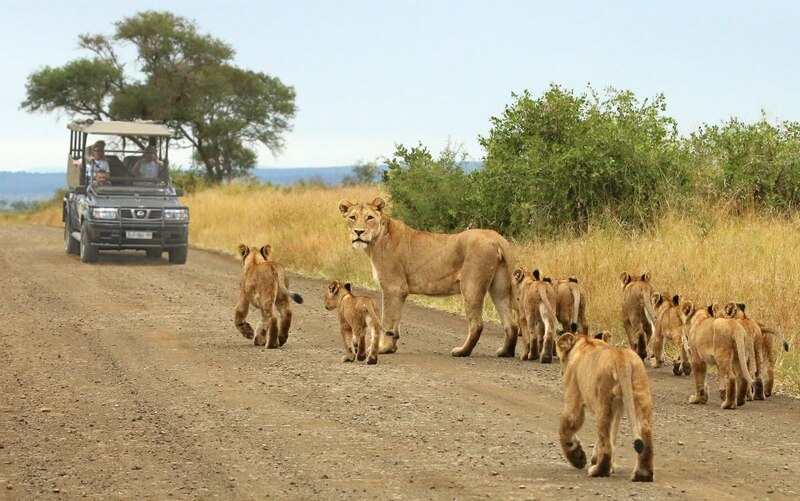 This safari is conducted in “open” Land Cruisers with professional guides. After the 3 hour safari, at 18h30/19h00, you will return to Rhino Ridge Safari Lodge for dinner. Dinner will be in the restaurant or on the deck under the African stars. Overnight at Rhino Ridge Safari Lodge in an air-conditioned, en suite, “Safari” Room on a fully inclusive basis. 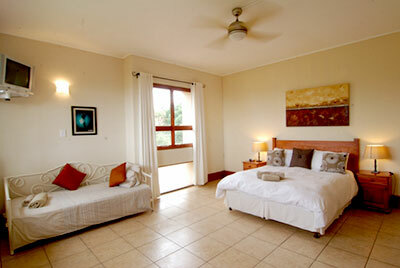 Accommodation at Rhino Ridge Safari Lodge in an air-conditioned, en suite, “Safari” Room on a fully inclusive basis. Two full days spent on safari with Rhino Ridge Safari Lodge in Hluhluwe–Umfolozi Game Reserve. You will be woken up at 05h30/06h00 by an early morning wake up telephone call for early morning tea / coffee and “rusks” which are served in the lodge’s public area, after which you will depart on your early morning safari at about 06h00/06h30. Please check departure times with reception the night before, as this changes from month to month, depending on sunrise. All animal viewing is best done in the early morning and late afternoon when it’s cool. This is when the animals are more active and easier to spot. 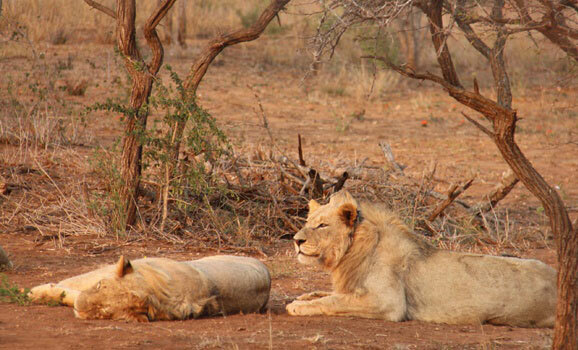 From about 10h00 till 15h00, when the day is at its hottest, the animals tend to lie in the shade, not moving, which makes for difficult game viewing. While on safari, you will stop somewhere in the bush for tea / coffee and snacks, after which, you will continue with the safari. Depending on animal activity, you will return to the lodge at about 09h00/09h30 for “brunch”. Rest of the morning / afternoon free to laze by the pool, visit the Spa, spend time bird watching around camp, or join a three hour guided bush walk. Please note that the cost of the guided bush walks is ZAR 640 per person, and is not included in the cost below, and would be for your own account. At about 15h00/15h30, you will again assemble for high tea before departing on the evening safari. At sunset you will stop somewhere in the bush for “sundowners” whilst you watch the African set below the horizon. After sunset, you will continue with the safari into the night, looking for the nocturnal animals with the aid of a powerful spot lamp. 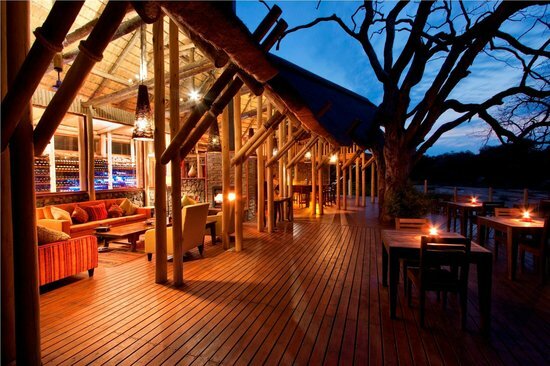 After the evening safari, depending on animal activity, you will return to Rhino Ridge Safari Lodge for dinner. Overnight at Rhino Ridge Safari Lodge in an air-conditioned, en suite, “Safari” Room on a fully inclusive basis. 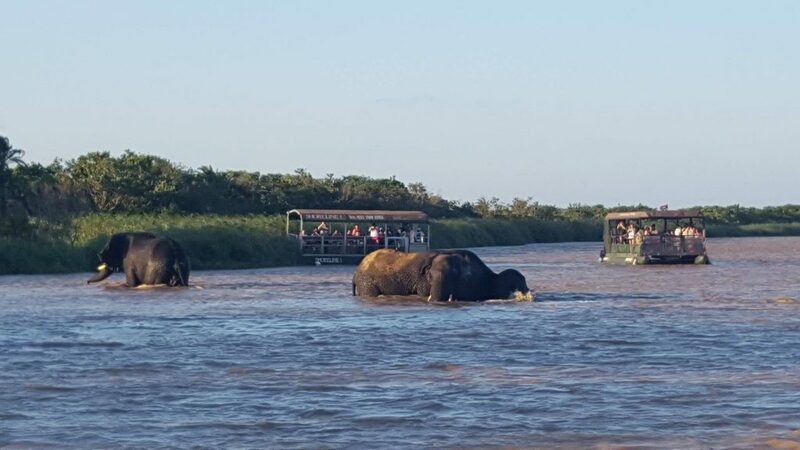 In between morning and evening game drives, the following activities are available at Rhino Ridge: A visit Isimangaliso Wetland Park; a visit to the Border Caves; a visit to the Nongomo Market; a cultural tour. The costs of these activities are not included in the cost of this tour, and will be for your own account. After the early morning safari followed by brunch, you will be collected from Rhino Ridge Safari Lodge by a representative of Dive The Big 5 for the 2.5-hour road transfer to the iSimangaliso World Heritage site, Sodwana Bay National Park and to the Coral Divers “Dive Resort”. On arrival at Coral Divers in Sodwana, you will check into your en-suite Cabin, and after settling in you will attend dive planning, which is held at 18h45, every evening, at Coral Divers. Here you will be allocated your dive equipment and meet your Divemaster who will explain how the times and shuttles work etc. and answer any questions you may have. After dive planning, a buffet dinner is served. Overnight at Coral Divers, in an air-conditioned, Ensuite chalet, on a dinner, bed and breakfast basis. 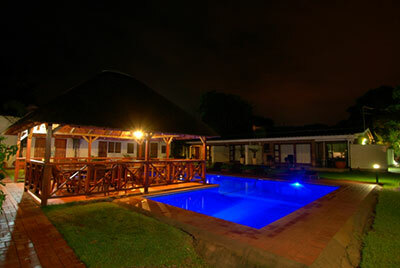 Accommodation at Coral Divers, in an air conditioned, Ensuite chalet, on a dinner, bed and breakfast basis. After an early wake up, you will walk the short distance from your chalet to the complimentary beach shuttle, which will take you to the main beach. The shuttle will depart from the front of the lodge exactly 45 minutes prior to your booked dive time. Breakfast is served in the lodge’s main dining area from 7am until 10am. If you wish, you will be able to have breakfast prior to your 1st dive, however most divers prefer to do one dive first, and then come back up to the lodge for breakfast before taking the shuttle back to the beach for the 2nd dive. On arrival at the beach you will meet “the Dive Crew,” in Coral Divers’ private gazebo, sign the indemnity, and then kit-up on the beach. Your equipment will then be loaded on the boat and your Dive master will brief you on the dive site on which you will be diving and boat etiquette. The tractor pushes the “duck,” into the sea for the planned dive on 2-Mile Reef, which is only one of the many magnificent coral reefs dive sites of Sodwana Bay, weather permitting. The surf launches at “Soddies” are far tamer than the launches at Aliwal Shoal. Once the boat has been pushed into the surf by the tractor, and is about waist deep, the skipper asks all the ladies to board the boat, and position themselves opposite their dive gear, which has been stowed aboard by Coral Divers’ crew. The men then board the boat, and once everybody is settled, the skipper “guns” the motors and skilfully punches his way through the breaking surf to the relative calm beyond the back-line. Once everyone is settled, it’s off to the reef. Quite exciting! The reefs at ‘Soddies’ are the southernmost tropical coral reefs in the world, and are even more south than Australia’s Great Barrier Reef. The Great Barrier Reef has 1 800 species of fish, and Sodwana, which is 1/10 the size of the Great Barrier Reef, has 1 200 species of fish, six of which are endemic to the Sodwana area. Your chances of seeing more species of fish are greater at Sodwana than on the Great Barrier Reef, due to the concentration of the fish in the area that you are diving! 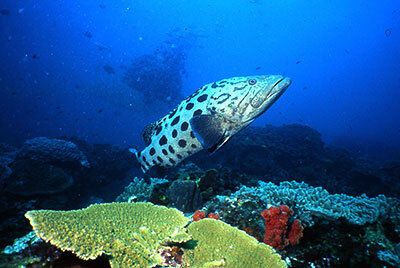 Both your dives are scheduled for 2-Mile Reef, the largest of Sodwana’s Reefs. Should you wish to dive on either Five-Mile Reef, Six-Mile Reef, Seven-Mile Reef, Eight-Mile Reef or the fabulous and seldom dived, Nine-Mile Reef, the applicable far reef surcharges would be for your own account, and dives on these further reefs should be booked in advance, at Coral Divers the evening before. Sodwana’s reefs are all unromantically named by the distance they are from the launch site, Jesser Point. For a deep dive, ‘Deep Sponge’ is a must, and is best dived on Nitrox, which is available at Sodwana at an extra cost of ZAR 80 per fill. Please be advised that all diving in South Africa is best done early in the morning, just after sunrise, because as the morning wears on, the wind tends to pick up, causing a chop on the water, which makes for unpleasant diving. This leaves the afternoons free to explore the iSimangaliso Wetland Park. In addition to diving, and deep-sea fishing, there are microlight flights of between 10 and 45-minute durations, boat-based snorkelling, and whale watching from June – November. None of these activities has been included in the cost below and would be for your own account. Overnight at Coral Divers, in an air conditioned, Ensuite chalet, on a dinner, bed and breakfast basis. Full equipment hire, services of a qualified dive master to lead all dives, dinner, accommodation at Coral Divers, in an air conditioned, Ensuite chalet, on a dinner, bed and breakfast basis. After breakfast, at a time to be advised, depending on the departure time of your flight out of King Shaka International Airport – Durban (DUR) you will be collected from Coral Divers by a representative of Dive the Big 5 for the 330 km’s or 4.5-hour road transfer back to King Shaka International Airport – Durban. End of services. Road transfer from Coral Divers – Sodwana Bay to King Shaka International Airport – Durban. Please note: Hluhluwe / iMfolozi, as well as Sodwana Bay, fall within a “low-risk” Malaria area. To be safe, we strongly suggest that you consult your Doctor for advice on taking prophylactics before entering a “low risk” Malaria area.